Swansea target Graham Potter says he is in discussions to take over as manager. The 43-year-old Ostersund boss and club chairman Daniel Kindberg told a news conference that Potter had been given permission to speak to Swansea. Swansea are seeking a new manager after parting company with Carlos Carvalhal following the club's relegation from the Premier League, but Potter said his appointment is not yet a done deal. "I have to talk to them [Swansea] a little more," Englishman Potter said. "Obviously it's a big challenge to take the club back to the Premier League and give them an identity, so it's clear that it's interesting, but there's still a long way to go." Potter was speaking after the weekend's 2-0 win over Hacken, which lifted Ostersund into eighth in the Swedish Allsvenskan. "We've been doing well for the club for a long time, so I'm proud of it, but I'm still Ostersund coach," added Potter, who has overseen a remarkable rise in fortunes at the club. He agreed to become Ostersund manager in December 2010 and moved to Sweden with his family in January 2011. 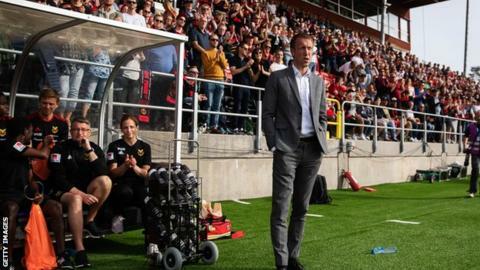 Ostersund were languishing in the Swedish fourth division but Potter won back-to-back promotions in his first two seasons at the club, before reaching the Allsvenskan top flight for the first time in 2016. The club finished eighth in their first season and also won the Svenska Cupen, Sweden's main cup competition, meaning they qualified for the Europa League. They reached the round of 32 before being beaten 4-2 on aggregate by Arsenal, despite giving the Premier League club a scare by winning the second leg 2-1 at Emirates Stadium. Kindberg would understandably be reluctant to see Potter depart after he has helped transform the club, but the chairman confirmed he has been approached by Swansea chairman Huw Jenkins. "He asked me if he could speak to Graham and make his case - and I have given permission," Kindberg said. "This does not mean Graham leaves, we are not there. "I will always allow anyone to talk to him, we have confidence in Ostersund. "It's quite simple. Graham and I have been working together for a long time and have always been sincere with each other." Should Potter join Swansea, with an announcement expected this week, then he is likely to want to bring assistant coach Billy Reid and scout Kyle Macauley with him to Wales. There is also speculation that forward Saman Ghoddos and midfielder Ken Sema, whose contract ends in December, could follow their boss if he leaves and become Swansea players. Both players have been linked with other clubs, with Celta Vigo in Spain thought to be interested in Ghoddos.